NASA's Hubble Space Telescope has found the building blocks for Earth-sized planets in an unlikely place- the atmospheres of a pair of burned-out stars called white dwarfs. These dead stars are located 150 light-years from Earth in a relatively young star cluster, Hyades, in the constellation Taurus. The star cluster is only 625 million years old. The white dwarfs are being polluted by asteroid-like debris falling onto them. [image-01]Hubble's Cosmic Origins Spectrograph observed silicon and only low levels of carbon in the white dwarfs' atmospheres. Silicon is a major ingredient of the rocky material that constitutes Earth and other solid planets in our solar system. Carbon, which helps determine properties and origin of planetary debris, generally is depleted or absent in rocky, Earth-like material. "We have identified chemical evidence for the building blocks of rocky planets," said Jay Farihi of the University of Cambridge in England. He is lead author of a new study appearing in the Monthly Notices of the Royal Astronomical Society. "When these stars were born, they built planets, and there's a good chance they currently retain some of them. The material we are seeing is evidence of this. The debris is at least as rocky as the most primitive terrestrial bodies in our solar system." This discovery suggests rocky planet assembly is common around stars, and it offers insight into what will happen in our own solar system when our sun burns out 5 billion years from now. Farihi's research suggests asteroids less than 100 miles (160 kilometers) wide probably were torn apart by the white dwarfs' strong gravitational forces. Asteroids are thought to consist of the same materials that form terrestrial planets, and seeing evidence of asteroids points to the possibility of Earth-sized planets in the same system. The pulverized material may have been pulled into a ring around the stars and eventually funneled onto the dead stars. The silicon may have come from asteroids that were shredded by the white dwarfs' gravity when they veered too close to the dead stars. "It's difficult to imagine another mechanism than gravity that causes material to get close enough to rain down onto the star," Farihi said. By the same token, when our sun burns out, the balance of gravitational forces between the sun and Jupiter will change, disrupting the main asteroid belt. Asteroids that veer too close to the sun will be broken up, and the debris could be pulled into a ring around the dead sun. According to Farihi, using Hubble to analyze the atmospheres of white dwarfs is the best method for finding the signatures of solid planet chemistry and determining their composition. "Normally, white dwarfs are like blank pieces of paper, containing only the light elements hydrogen and helium,"Farihi said. "Heavy elements like silicon and carbon sink to the core. The one thing the white dwarf pollution technique gives us that we just won't get with any other planet-detection technique is the chemistry of solid planets." The two "polluted" Hyades white dwarfs are part of the team's search of planetary debris around more than 100 white dwarfs, led by Boris Gansicke of the University of Warwick in England. Team member Detlev Koester of the University of Kiel in Germany is using sophisticated computer models of white dwarf atmospheres to determine the abundances of various elements that can be traced to planets in the Hubble spectrograph data. Fahiri's team plans to analyze more white dwarfs using the same technique to identify not only the rocks' composition, but also their parent bodies. 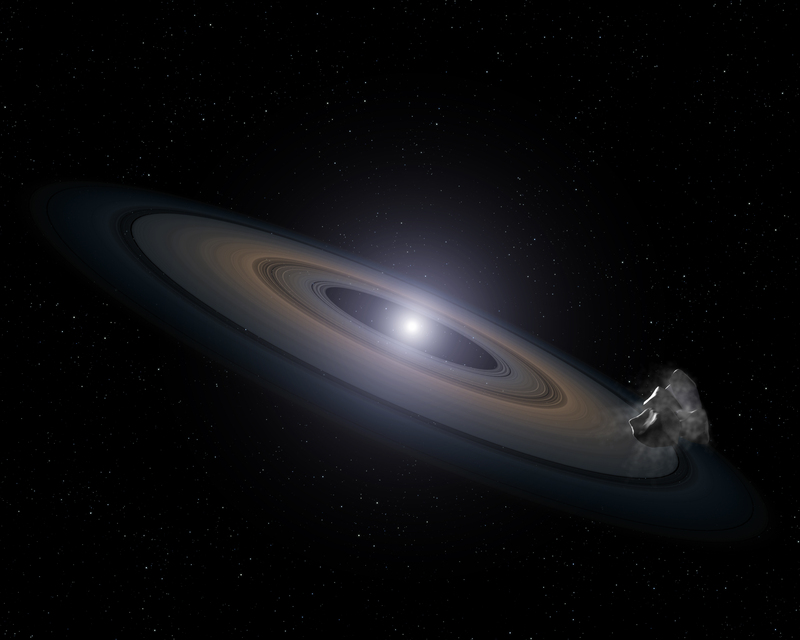 This is an artist's impression of a white dwarf (burned-out) star accreting rocky debris left behind by the star's surviving planetary system. It was observed by Hubble in the Hyades star cluster. At lower right, an asteroid can be seen falling toward a Saturn-like disk of dust that is encircling the dead star. Infalling asteroids pollute the white dwarf's atmosphere with silicon.